Anne Louise Germaine de Staël-Holstein (1766 – 1817), daughter of the prominent Swiss banker and statesman Jacques Necker, who was the Director of Finance under King Louis XVI of France could be called a feminist and an emancipated one at that. Her mother equally famous for being the early love of Edward Gibbon,was a leading light of one of the most popular salons of Paris . Mother and daughter had little sympathy for each other. Mme Necker, despite her talents, her beauty and her fondness for philosophic society, was strictly decorous, somewhat reserved, and wanted to bring up her daughter with the discipline of her own childhood. Anne Louise was from her earliest years energetic and boisterous. She began very early to write, though not to publish. Her father’s dismissal from the ministry and the consequent removal of the family from the busy life of Paris were probably beneficial to her. She married Baron Erik Magnus Staël von Holstein. The husband was 37, the wife 20. Neither of whom had any affection for the other. The baron obtained money and the lady obtained, as a guaranteed ambassadress of a foreign power of consideration, a much higher position at court and in society than she could have secured by marrying almost any Frenchman. Then in 1788 (a year prior to the French Revolution) she appeared as an author under her own name and became fascinated with the ideas of Rousseau. She was embroiled in political intrigues at this time and equally was she steeped literary criticism and she was highly influential. She then moved to Coppet, and there gathered round her a considerable number of friends and fellow-refugees, the beginning of the salon which at intervals during the next 25 years made the place so famous. However, in 1793 she made a long visit to England, and established a connection with other emigrants: Talleyrand, Narbonne, Montmorency, Jaucourt and others. In the summer, she returned to Coppet and wrote a pamphlet on the queen’s execution. The next year, her mother died, and the fall of Robespierre opened the way back to Paris. She reopened her salon and for a time was conspicuous in the motley and eccentric society of the Directory. 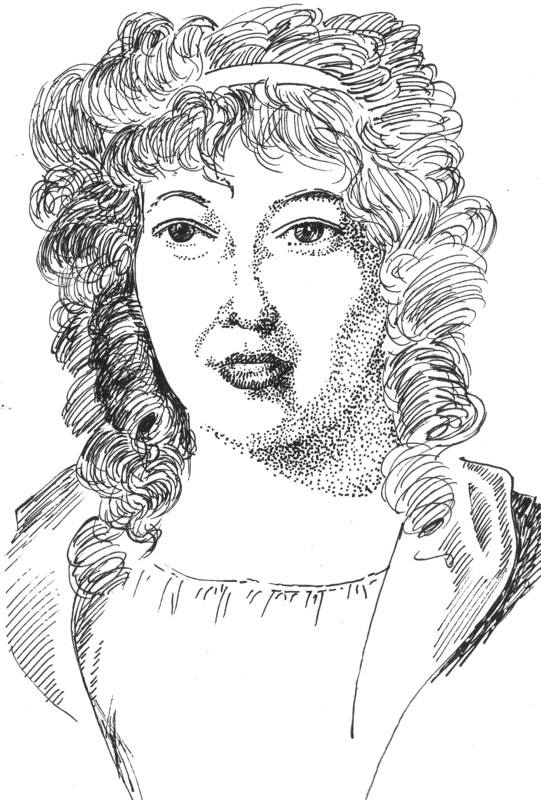 She also published several small works, the chief being the essays Sur l’influence des passions “On the influence of passions” (1796), and Sur la litérature considérée dans ses rapports avec les institutions sociales (1800). It was during these years that Mme de Staël was the muse and sounding board for movers and shakers of ideas that were gathering momentum. Narbonne’s place had been supplanted by Benjamin Constant, whom she first met at Coppet in 1794, and who had a very great influence over her, as in return she had over him. Both personal and political reasons threw her into opposition to Bonaparte. Her own preference for a moderate republic or a constitutional monarchy was quite sincere, and, even if it had not been so, her own character and Napoleon’s were too much alike in some points to admit of their getting on together. ( Napoleon said about her, according to the Memoirs of Mme. de Remusat, that she “teaches people to think who never thought before, or who had forgotten how to think.”) In 1797 she separated formally from her husband. Napoleon was irked by her opposition to him. She was directed not to reside within 40 leagues of Paris, and after considerable delay she determined to go to Germany. During her German travels her father died. She had bought property in America and thought of moving there, but she was determined to publish De l’Allemagne in Paris. Straining under French censorship, she wrote to the emperor a provoking and perhaps undignified letter and as a result the whole edition of her book (ten thousand copies) was condemned as not French. She retired once more to Coppet, where she was not at first interfered with, and she found consolation in a young officer of Swiss origin named Albert de Rocca, twenty-three years her junior, whom she married privately in 1811. Napoleon’s spies were closing in and her friends Mathieu de Montmorency and Mme Récamier were exiled for the crime of seeing her. On 23 May 1811 she left Coppet almost secretly, and journeyed to Vienna. There she obtained an Austrian passport to the frontier, and after some fears and trouble, receiving a Russian passport in Galicia, she at last escaped from Napoleon’s omnipotent eyes and far reach. She journeyed slowly through Russia and Finland to Sweden, making a stay at Saint Petersburg, spent the winter in Stockholm, and then set out for England. Here she received a brilliant reception and was much lionized during the season of 1813. She published De l’Allemagne in the autumn. She was in Paris when the news of Napoleon’s landing arrived and at once fled to Coppet. And it is certain that she had no affection for the Bourbons. In October, after Waterloo, she set out for Italy for the benefit of her second husband, Rocca, who was dying of consumption. Her daughter married Duke Victor de Broglie on 20 February 1816, at Pisa, and became the wife and mother of French statesmen of distinction. The whole family returned to Coppet in June, and Lord Byron now frequently visited Mme de Staël there. Despite her increasing ill-health she returned to Paris for the winter of 1816-1817, and her salon was much frequented. But she had already become confined to her room if not to her bed. She died on 14 July, and Rocca survived her little more than six months. “And without possessing either,” came her prompt reply. Beautiful protrait Benny. Your stippling, line hatching, and cross hatching…they all work in this one. For me the way you have done her clothes is the best part.